Arrange the taro slices in a steaming plate and steam over high heat for 20 minutes. Remove and leave to cool. Heat the oil and stir-fry the spring onions until fragrant. Scoop out the spring onion and reserve the cooking oil. In a bowl, mash the taro into a paste with a masher or the back of a fork. Next, fold the sugar into the mashed taro, turning the bowl as you press the sugar into the taro, until evenly mixed. Heat up the cooking oil, then add in the mashed taro and start stirring with a spatula. Keep stirring and you will see the taro take on a smooth consistency as it absorbs the oil. It is ready when the taro paste ends up like a well-kneaded ball of dough. Scald gingko nuts in boiling water with a little sugar and drain. 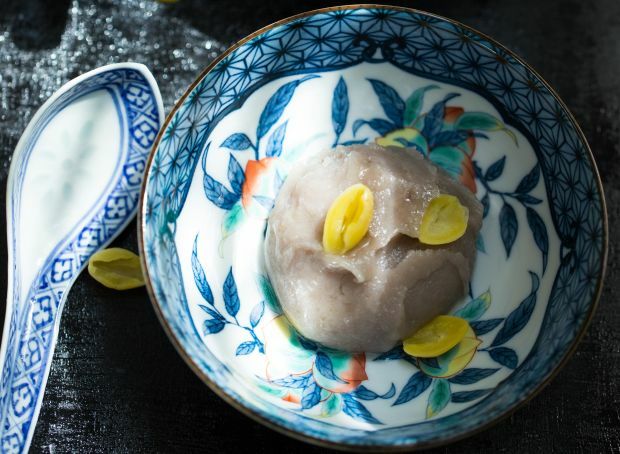 Scoop the taro paste into small bowls and garnish with gingko nuts as desired on top of the taro paste. Serve warm. Tip: • Do not add water when mashing the taro, even though it may look dry. • Once done, the paste can be stored in the fridge for two to three days or in the freezer for a week. • A speedier and easier alternative is to put the mashed taro, shallot oil and sugar into a food processor and blend until you have a smooth paste.